The Race Face BSA 30mm Bottom Bracket was made to work with their 30mm Cinch interface system. The Cinch system uses a 30mm spindle to provide a stiffer bottom bracket/crankset interface, but previously this would limit you to BB30/PF30 frames €“ not with Cinch! These new BSA 30 bottom brackets will allow you to fit your Race Face Cinch 30mm spindle crankset in a standard threaded bottom bracket. Don't let your bottom bracket shell width keep you from experiencing 30mm spindles! Had these for 2 years now although they have never had any show stopping issues, I find the bearings to be crappy. I had to replace the bearings towards the end of each season. Since they are standard bearings, they are easy to replace. The bearings have a good seal, but it adds a lot of friction to the unit. In comparison, my King bottom brackets have been working great for about 6 years now. Not a lot of options for the BSA30 bottom brackets, but the King NoThread30 or Enduro BSA30 angular contact bearings bottom brackets will be a more reliable alternate. Lighter than the stock BB and smooth. I have about 300 miles on this BB so far and would buy it again. This BB is the only option that I know of for RF Cinch cranksets. The bearings are smooth on initial installation but the seals are not that great and allow water/debris intrusion. I have wiped out my drive side bearing after 1 year of use. Need to check these bearings often. As others stated, requires proprietary tool for install/removal. Not a big deal but most shops do not have this tool so you need one yourself which adds to the cost of ownership. needed a replacement and this one fit the bill and fixed the problem I was having. Great product as most race face products are. And the price was best at Jenson. Exactly what I needed for the cranks. Bearings are smooth. easy to install, looks great, works great and super light. Looks massive, nice n' stiff. Love the size of a 30mm bb but wasn't fully aware of needing a new tool for install. Otherwise love it. Works great and went in like a breeze, I did use the raceface tool though. Great option if you want to run a 30mm spindle. You will need to get the tool to put these on properly due to the 30mm size. I love raceface products . Looks grate and very well made. Last a long time even if the color fades away. Great service, quick delivery even to Hawaii. Everything went together smoothly. Make sure you get the right BB tool to install it; Race Face and Part both make one. Good bottom bracket. I have not had any problems, bearings run very smoothly, though I have changed the bearings to angular contact. Well i love race face turbine crank and i was looking for. This bb to be abble to installed on a specialized chizel, i definitely recoment this bb is smooth ez to install and will last for a long time!!! Good fit and easy install. Could use different dust covers though. i LOVE the packing and it's very nicely done up. it really got the stuffs well protected. Make sure you have the correct spacers installed to fit your specific BB width. It requires a high torque which could ruin the bearings if done incorrectly. 1. If you have the Race Face BB tool, installing these is a breeze. Instructions are as clear as those that come with Legos, and the BB is prepared with thread locker to keep things tight. Plug 'n' play if you have the tool. 2. These are smooth BBs even under heavy trail use in wet and dirty conditions with minimal care. 3. I've noticed that no matter whether I keep these super-clean or just let 'em bear the abuse on their own terms, I get about 2 seasons out of them and then they start making noise. I've found these for $35 - $50, so that's $25/season or less to keep pedaling smoothly. Great for the price and easily mates with other RF products. Will last if you keep kn top of maintaining it like any other bearing. I have gone through 2 of these BB's.the first one made through a whole season of good use, dry conditions. bearing went bad in the next season. I bought another one, which was stiff from the beginning, and the bearing went bad within a few months, again, in dry conditions. I have replaced the bearing with NTN bearings for this season. we'll see how it goes. At first I thought wow, then after onky 17 miles, I said, this is the worst garbage that has ever been made. You guest it, the BB failed... 17 miles of riding! It's one of only a few (that I know of) threaded outboard 30mm BBs, so that's why it get's one star vs zero. Drive side bearings failed after 5 rides. I've installed dozens of BBs on several bikes, so I have confidence that failure was not installation related. My BBs typically last me a long time. Bearings wore out after 3000 km. My FSA MegaExo's went 15,000 km and still felt new. And why do they label them with stickers, it looks cheap and they fall off. The RaceFace cinch cranks are really nice, but the bottom bracket is a disappointment. Searched all over for a good price on this item and Jenson had it for cheaper than anyone else. Got it the next day, with FREE SHIPPING. Stop looking around and just buy at JENSON!!!! Service was fine. Delivery was a bit slow and was delayed by 4 days because of a problem with ups. Too pricy compared to the other offerings from race face. Not using it, compatibility issues. The product is fine. Unfortunately, the standard press for spindle to be converted to threaded is not long enough. I should have know this. No one tells you that in order to squeeze this into a 68/73mm bb you must cut down the screw for the cable guide under the bb. YOU ALSO NEED THE $30 TOOL IN ORDER TO INSTALL. The dust covers are VERY tight on the spindle. I wish I would have known that going in as well. I installed this BB and my Race Face Next SL cranks. The cranks wouldn't turn freely at all. My cheap BB and cranks spun forever. Does this BB will fit for a E*13 TRS+ crankset? Will it work with SRAM crank that is made for bb30? BEST ANSWER: This BB is made for a 30 mm diameter spindle found on cranks like the next sl so check that measurement. Should work on any 30mm threaded BB. Make sure you order correct width. Oh yes, of course. It's universal fit across all standards. How do you remove the bearings from these? BEST ANSWER: You shouldn't, you can remove the dust shield to clean and grease. Don't expect to remove the bearing and reinstall and everything be ok !! It usually makes more sense to just buy a new BB when the bearings wear out. 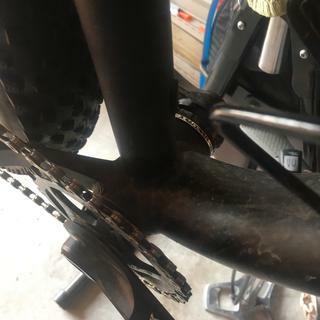 Can this crankset be used on a standard threaded 73mm frame with a RaceFace Cinch BSA 30mm BB? BEST ANSWER: Yes, this BB should work. The main note about these cranks is that they have a longer spindle than the BB30 standard. This allows the cranks to work on a larger number of frames. The BSA30 bottom brackets are compatible for both brands. E13 sells their own version, as well. How many spacer do I need to install on each side of the bottom bracket, or are the spacing already taken into account in the design? The number of spacers depends on the width of your BB shell. There are instructions included with the BB that will clearly indicate how many spacers you will need based on the measurement of your BB shell. The spacers are also included in the package for most common BB shell sizes. Also, you will need a specific BB tool to accommodate the larger diameter of this BSA 30. What is the width of these? BEST ANSWER: Andres, Looks like these are available in 83mm, 68/73mm, and 100mm width options, all of which are in stock. I hope that helps. I am using race face BB30 and I need for replacement, But I want know what is the size of my spindle.There is a 3 option to choose and I dont know which size of spindle will fit to my double crank Race Face Turbine! BEST ANSWER: You don't need to measure your spindle. You need to measure the width of your BB shell. You can do this with a household ruler.